So many kits so little time to spare with seeds begging to be grown! 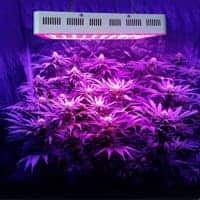 Lets take a look the different types of Marijuana Growing kits available to suit everyone’s budget, space or seed choice. Coco is derived from the natural source of coconut husks and it feels similar to growing in soil but is whole lot cleaner as it holds a lot of oxygen which also enables massive plant growth. Coco is very easy to start off, and you are able to achieve fabulous harvests every 3-4 months when combined with a hydrophobic set up. Seedlings do best if started in a controlled environment unlike the older plant. Propagation tents so these offer a soundproof, lightproof and odour proof setting. 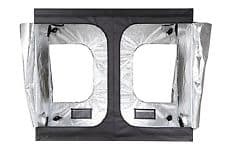 Most tents will have a reflective inner layer maximizing available light that you supply, and humidity is kept high at around 80% during the plants first weeks of life. Some tents offer shelves creating plenty of room for seeds and/or clones. A good quality tent will contain the unmistakable strong smell of a growing cannabis plant. 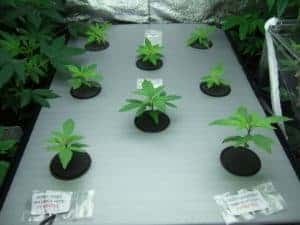 A simple starter kit offers a floating seed starter tray which contains see starter plugs all encased in a humidity dome that has a heat mat at the bottom. If you are buying one of these keep your eyes out for those that have a larger heat pad that fully cover the whole base and also those that have Styrofoam inserts as they provide a steadier water dosage and prevent the seedlings drying out too fast. Also its better to get a starter plug that has a bark medium which has been nutrient doused, rather than a coco compressed plug as they can fall apart. 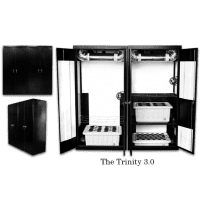 From slightly more budget to top of the range, cabinets provide a secluded space that can be secured containing a complete growing environment with various lighting packages as well as fans/ventilation as well as heating options. This ensures that your harvest is kept out of sight, secure and with no tell tale odours being detected. 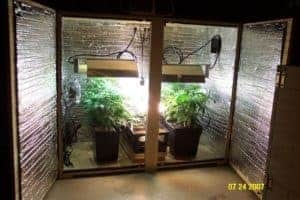 A simple budget set up consisting of a frame which sits over your pots, from which a lighting bar is suspended from over your plants. These come in various sizes and heights and are easy to set up and move around over your bushes. Various Hydrophonic kits are available all giving a soil free growing environment. The wick system is the more simple type set up, this is a non moving system and the nutrients are drawn up through the wick into the growing medium from the water reservoir. The mediums commonly used are perlite, pro-mix, coco and vermiculite. The only draw back to this system is that the plants that are larger will need more solution faster than the wicks can provide. The water culture system is based on a platform that is suspended over water and an air pump supplies air to a stone at the bottom of the water tank (air stone) and the air bubbles supply the nutrient solution to the roots. This works by temporarily flooding the growing tray with nutrient solution and then draining the solution back into reservoir. This process is achieved with a submerged pump that is connected to a timer that turns on the pump at set intervals and when it is turned off the nutrient solution flows back into the tank. Depending on how many plants and their size the timer can be adjusted for optimal watering, temp and humidity. The mediums commonly used with this system is grow rocks, perlite, faffards, promix or rockwool, which can also have their different benefits on roots drying out to quick etc. 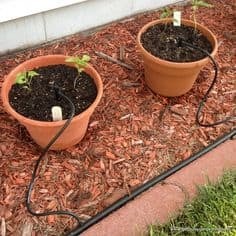 This are the most commonly used systems a timer controls a submerged pump which pump the nutrient solution up pipes that are over handing the plants and drips onto the base of the plant. The excess solution drains out of the base. There are recovery systems that allow the solution to be re-used or non recovery systems that do not collect and reuse the run off for those wishing to have an easier maintained PH level as the levels will not vary in the reservoir. This system is usually the one that people associate Hydrophonics with. NFT systems supply a constant supply of nutrient solution and therefore no timer is required for the submersible pump. The solution is pumped into the growing tray by tubes and flows over the roots that have grow into the tank space, then it drains back into the reservoir. With this set up there is usually no medium other than air, which saves on costs. The plant is supported in a small plastic basket. The only thing you have to be careful of is a good pump as when it stops there is no wet medium to keep the roots from drying out.